One of my followers on Twitter asked for a good shrimp fried rice recipe she could make at home, and with shrimp being a favorite around here, I was happy to take on the challenge. There's plenty of reasons why this is a relatively easy dinner dish. I found a little inspiration from America's Test Kitchen's recipe for Indonesian-Style Fried Rice, which curiously came on TV the night I was brainstorming ideas. 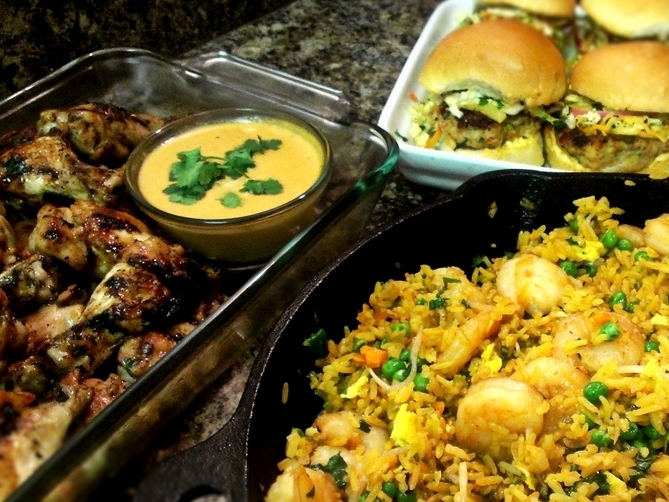 I came up with my own version and tried it out for Super Bowl Sunday, along with a couple other Thai-inspired dishes like ginger-soy glazed wings, peanut sauce and a spicy mango chicken slider. This is a delicious shrimp fried rice dish that's easy to do at home and has some unexpected ingredients that really take the flavor to a new place. The tough part about making fried rice is having cold cooked rice on hand. Have you ever tried to fry hot, moist rice? I have, and trust me it's a mushy mess. Now, while I often have one or two servings of rice leftover from a dinner earlier in the week, it's rare that I have a whole pot of it, at least not when I need to. America's Test Kitchen solved this problem with an ingenious method for the cooking rice the same day and cooling it in no time at all. For my Shrimp Fried Coconut Rice, I specifically chose items that wouldn't take long to prep. One thing that can be frustrating about stir fried dishes is all the slicing, chopping & dicing you have to do. For this dish, I'm using frozen peas (I hate peas in general but keep a bag in the freezer for easy adds to pastas, rice and curries) and bean sprouts, which require none of that. It's relatively easy to mince ginger, but I found that those little jars of organic minced ginger are perfectly fine short cut in recipes calling for small amounts. Carrots don't take long to shred in a food processor and most grocery stores sell also small bags of shredded carrot. If you probably won't use whole carrots in your kitchen, that's not a bad idea to avoid wasting the rest. Shrimp was the most expensive ingredient but it is one thing we regularly splurge on in this house, and unfortunately I couldn't catch a decent sale that week. Fresh or frozen shrimp that's already been peeled and deveined will save you the most work. And shallots are a new thing for me but I've quickly grown to become a big fan - they pack the flavor of garlic and onions in one punch. Speaking of America's Test Kitchen, I'm signing up for their new online cooking courses! I've been such a fan of the brand between their website, Cook's Country television show and Cook's Illustrated magazine, that this was a no-brainer. 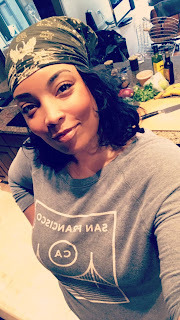 Can't wait to work some of my course assignments into new recipes for my blog, so I'll keep you guys posted on what the classes are like. You could definitely use plain cooked Jasmine rice and this will still be a great recipe. I cooked my rice in coconut milk and turmeric to add another layer of Thai-inspired flavor to my dish though. It's a modified version of my usual recipe that I tweaked to work better for fried rice. I got the idea from America's Test Kitchen's recipe for Faux Leftover Rice, which I turned to because I was making this all the same day. Hot cooked rice does not a good fried rice make, so you really do want to utilize leftover chilled rice or go ahead and follow the steps below to speed up that process if you need to cook it the same day. In a large pot over medium high heat, toast the rice in coconut oil for a minute or so, long enough to get all the rice grains coated in oil. Stir in the turmeric powder and kosher salt, stirring to continue toasting the rice until the yellow color of the turmeric is evenly distributed. Add the coconut milk and chicken stock. Bring to a boil then cover and reduce heat to low. Simmer for 15-18 min or until all liquid is absorbed. Spread rice out onto a baking sheet (I lined mine to prevent any sticking.) Transfer to fridge and chill at least twenty minutes, or until needed. 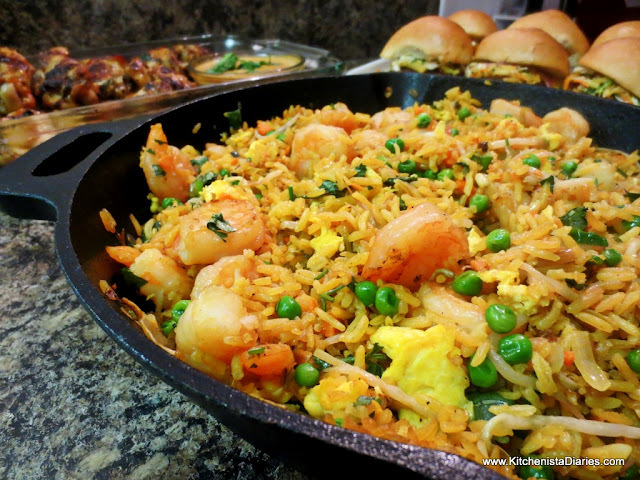 You'll want everything near the stove and ready to add to the skillet as the fried rice is being prepared. Combine the palm sugar, soy sauce, fish sauce and Sriracha and set aside once mixed. I preheated my 12" cast iron skillet over medium high heat, but adjust temperature if using a wok or other type of skillet. Add two tablespoons of coconut oil to the hot skillet and saute the diced shallots until translucent. In a separate non-stick skillet, scramble the two beaten eggs in a teaspoon or so of oil. Hindsight is 20/20, so I probably would have just done this in my main skillet and then transferred them out. If you're trying to avoid the extra dish, that's the solution. When the shallots have cooked a couple minutes, add the minced ginger and stir. Add the bean sprouts and carrots, cook until sprouts start to wilt. Add your frozen peas, cook just a minute or so until warmed through. Transfer the cooked veggies to a dish. Add a tablespoon of coconut oil and the sesame oil. I've found sesame oil can overwhelm a dish easily, so I like to just add a little towards the end of my recipes now instead of cooking all my veggies in it. Add the peeled shrimp and cook just until the shrimp turn opaque, just a minute or two. As I warn you with every shrimp dish, please don't overcook it! Push the cooked shrimp towards the sides of the skillet. Pour the sauce into the center of the skillet and wait for it to bubble up before stirring to toss the shrimp in the sauce. Add the "leftover" rice to the skillet and reheat, mixing to incorporate the shrimp and sauce, and to prevent sticking. Fold the cooked veggies and scrambled eggs back into the fried rice. Stir in the scallions (I use kitchen shears to snip these right into my skillet) and garnish with chopped cilantro. Serve with lime wedges. I really hope you like this one; it's a great dish to add life to any party or festive dinner! What I love about making fried rice at home is that you can do it without being weighed down with tons of oil or soy sauce, and as long as you keep your pantry stocked it's a relatively simple list of ingredients. Make it your own with different veggies, or try it with chicken or even tofu. Leftovers were awesome the next day! 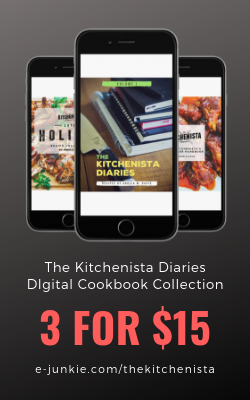 Found the best app for sharing recipes ever! It’s called Heirloom Recipes my sister just got it today and emailed me this recipe with the link and I got the free version to try it and OMG I imported the recipe right into the app no typing or anything! The email had the link to the free one: https://itunes.apple.com/app/id617619870. I’m going to make this for the family. We are all fried rice fans. Thanks so much!! !